Mongolia's physical environment is highly suitable for raising livestock, and the traditional, environmentally attuned nomadic pastoralism with its seasonal mobility from one pasture to another (to prevent overgrazing and erosion) persists today. * Mongolia's 33.6 million domesticated animals graze mostly on grasslands in the central zone and on the desert steppes of southern Mongolia. There are 14 times as many domesticated animals* as there are people. Since 1990, Mongolia has made the transition from socialism (where the state owns most property and people draw salaries from the state) to a free market economy. Today, Mongolian economic sectors are dependent on the global market and its price fluctuations, which open them up to competition and global market trends. 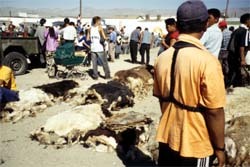 For example, in 1998 the global price of cashmere fell, affecting the lives of many Mongolian nomads. 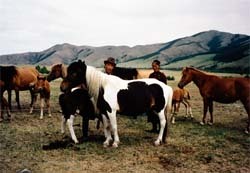 Nomads and their horses, Tuv Aimag, 1994. Mongolia's other main economic activity is mining and processing natural resources, since the country's natural wealth includes ample deposits of copper, molybdenum, fluorspar, coal, gold, silver, iron, chrome, zinc, mercury, precious stones, and crude oil. About 1/3 of Mongolia's exports are half-processed mineral materials. * Mongolia also produces construction, timber, and wood materials. Selling animal skins to the Russian market, Hovd Black Market, 1998.